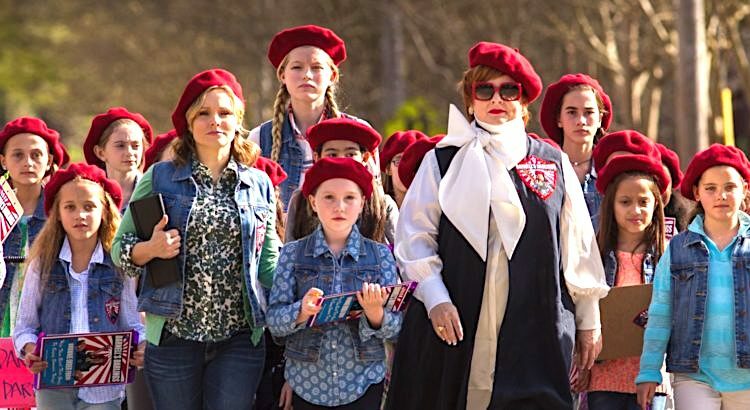 THE BOSS is the latest Melissa McCarthy vehicle. She plays Michelle Darnell, a powerful mogul who markets the attainment of wealth with a glitzy Tony Robbins style seminar. These are arena-sized events for ordinary folks who want to make it big like their idol. Michelle’s public persona is not subtle. She is a success-driven, A-type personality, who is also a narcissist that expects to be the centre of everyone’s attention. She has made enemies, in particular a man called Renault (Peter Dinklage). It is a clash with him that results in her being sent to white-collar prison for insider trading. (Not a spoiler, folks, this is in the movie’s set-up). When she emerges from prison, Michelle Darnell is penniless and friendless. No one wants to do business with an ex-con. Her circumstances are so reduced that she looks for help from the only person who will take her calls, her long-suffering former personal assistant Claire (Kristen Bell). As in any any decent redemption movie, Michelle hatches a plan to get back on top. Hers involves the equivalent of using Claire’s daughter’s Girl Scout Troop, but don’t get overly excited fans of Shelly Long and/or the 1980s, TROOP BEVERLY HILLS this ain’t. Melissa McCarthy is having her cultural moment right now. Since her breakthrough part in the Paul Feig directed BRIDESMAIDS (2011), she has been money-in-the-bank for producers and studios. THE HEAT (2013) and last year’s hit comedy SPY (also with Feig) have taken in US $200 million plus, each, internationally. Even her lesser-regarded comedies like IDENTITY THIEF (2013) have done brisk business at the box office. Most audiences find her flat-out funny. I have liked her work since she played Sookie in the Gilmore Girls (2000-07). She was justly Emmy nominated for her three guest starring appearances on Saturday Night Live. Mike and Molly (2010-16) is a far funnier series thanks to her. Whether she is playing someone down-to-earth and relatable or one of her crazed grotesques, she has a knack for making you laugh hard or feel a character’s vulnerability. The downside of the film is its story. Michelle Darnell is actually a terrible character, who says and does some awful things. The movie needed much tighter writing and direction to make this the equal of McCarthy’s best work. She co-wrote along with the movie’s director (and her real life husband) Ben Falcone. It must be said that this outing is an improvement on their last movie project, TAMMY (2014). That was critically drubbed and still made a mint. McCarthy plays Darnell with her usual sharp comedic skills and excellent timing and this is what saves THE BOSS. The physical slapstick and the verbal gags will entertain fans of her work, yet again. She is ably supported by Kristen Bell. Tyler Labine is winning as Bell’s slightly unlikely love interest. Peter Dinklage is funny as Darnell’s arch-nemesis Renault.